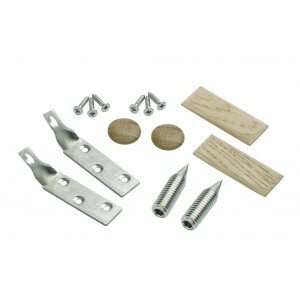 Kits include Stainless steel screws that fix a twist bracket to the underside of a handrail section. You can then easily fix the handrail in place against the newel post. Each kit contains two brackets for affixing each side of the handrail section to a newel. Elements with metal spindles range of stair parts can be assembled quickly with the universal fitting kit. Timber parts are screwed together and the metal spindles can be glued into the handrail and baserail. We have newel kits for both stair and landing handrails, so installing a new balustrade is made much easier.